I Know What I Hope I Get For Valentine’s Day! 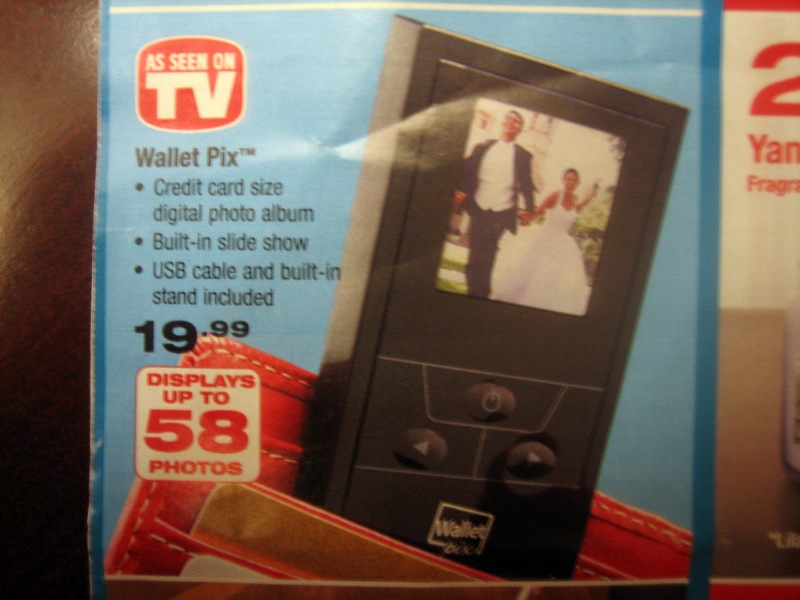 I was browsing through some junk mail the other day, when I came across an ad for this INCREDIBLY ADVANCED photo storage device. If you’ve already seen the TV commercial for Wallet PixTM, showing a bunch of older women showing pictures of their grandchildren to each other on this thing, then you know what I’m talking about. I mean, WOW! This thing is thicker than an iPod and most phones, probably so it can hold UP TO 58 PHOTOS! That’s like… a ZILLION photos! I’ll never be able to fill up that kind of storage. AND it comes with a built-in stand, for, you know, when you want to display family pictures on your end table on a screen that’s smaller than a credit card. Act now! Only $19.99!